Astronomers call Trappist-1 the most incredible star system they've ever seen. A newly discovered set of exoplanets only 39 light-years away could be the perfect lab for finally proving we aren't alone. A nearby, relatively dim little star nobody even noticed until about 20 years ago might be playing host to the most intriguing planetary party yet seen. On Wednesday, astronomers announced that the star, Trappist-1, is circled by at least seven Earth-sized planets, including three that could have oceans of liquid water to maybe, just maybe, support life. This artist's impression displays Trappist-1 and its planets reflected in a surface. The potential for water on each of the worlds is also represented by the frost, water pools and steam surrounding the scene. "Looking for life elsewhere, this system is probably our best bet as of today," said Brice-Olivier Demory, professor at the University of Bern's Center for Space and Habitability and one of the authors of a paper on the discovery published Wednesday in the journal Nature. The team first put Trappist-1 on the map last year with the announcement it hosted at least three planets, the first exoplanets to be spotted around an ultracool dwarf star, representing a whole new promising avenue in the search for life beyond the grasp of our own sun. Upon closer inspection and poring through data from telescopes around the world and NASA's Spitzer Space Telescope, the scientists realized what first appeared to be three planets is really at least seven -- and all only 39 light-years away. "This is really the first time we have seven planets which can be called terrestrial which are in the temperate zone," astronomer Michael Gillon at the University of Liège in Belgium told reporters on a conference call. "So many is really, really surprising." The seven planets, named Trappist-1b, c, d, e, f, g and h in order of increasing distance from their parent star, orbit much closer than all planets in our solar system, even Mercury. In fact, the astronomers on Gillon's team say the system better resembles the handful of rocky moons orbiting Jupiter. But because Trappist-1 is much smaller and cooler than our sun, it provides its more closely orbiting temperate zone planets with about as much energy as Venus, Earth and Mars get from our star. A size comparison of the planets of the Trappist-1 system, lined up in order of increasing distance from their host star. The planetary surfaces are portrayed with an artist's impression of their potential surface features, including water, ice, and atmospheres. "I think it's fantastic that Mother Nature has given us Proxima b and now the Trappist-seven as laboratories in our backyard," legendary alien hunter Jill Tarter said via email. 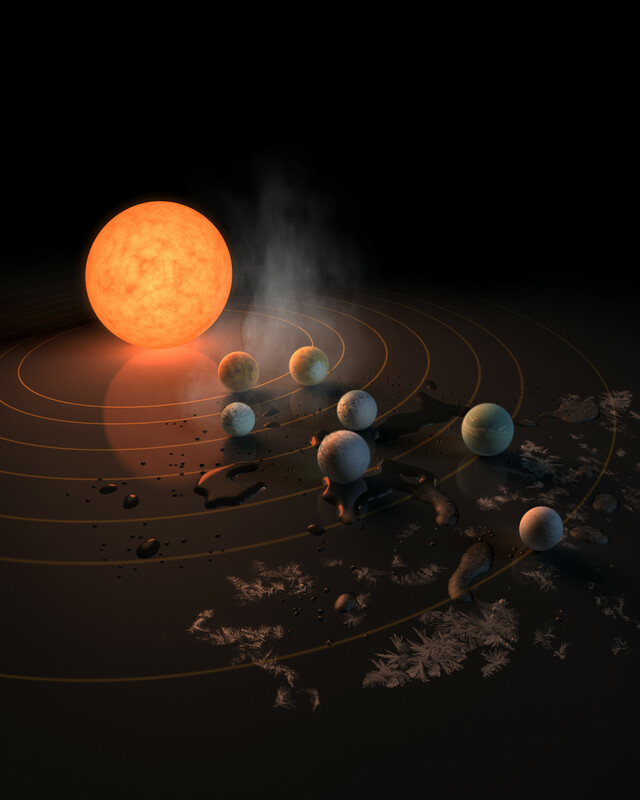 According to computer climate models, the system's innermost and hottest planets, Trappist-1b, c and d, likely have little or no liquid water on their surfaces, depending on atmospheric conditions. Then there are the three potentially habitable worlds, followed by the seventh, Trappist-1h, which astronomers were only able to observe passing in front of its star once, leaving its orbital distance unconfirmed but likely to be far enough that the surface is too cold for liquid oceans. It's also possible that even more planets circle Trappist-1 but are too difficult to observe from our angle here at Earth. This news is particularly exciting for astrobiologists, astronomers and planetary scientists because a new generation of giant telescopes is about to start coming online in the next couple of years. These Earth-like planets may be better than Proxima b to look for E.T. The NASA/ESA Hubble Space Telescope, designed in the '80s, is already searching for atmospheres around the planets, and upcoming facilities like the ultra-high-powered James Webb Space Telescope will further boost astronomers abilities to search for water and evidence of life. With Trappist-1 being so nearby, that discovery could come years earlier than anticipated. "This means we might be in the business of looking for aliens in a decade, and not, as others have envisioned, on a much longer timescale," Harvard astronomy professor David Charbonneau said via e-mail. "This planet is an important step in the quest." Charbonneau cautions that the system isn't quite the perfect subject to probe for life as he'd like to see more evidence that the planets are rocky like Earth and he also notes Trappist-1 is a very faint star. "We need those stellar photons to probe the atmosphere in transit," he said, "and I wish the star was more luminous... although it is such a spectacular discovery it is hard to complain about anything." Charbonneau and others are excited about what's called the "M-dwarf opportunity" in the hunt for E.T. "There is an abundance of cosmic real estate that could support life," SETI Institute senior astronomer Seth Shostak said via email. "Our earlier assumptions -- that Sun-like stars were the preferred environments for habitable worlds -- might be a bit too egocentric." The SETI Institute's Allen Telescope Array is in the midst of observing a list of 20,000 red dwarf stars, including Trappist-1. "(It) continues its hunt for signals that could tell us that these dim bulbs of the conference might have enlightened inhabitants," Shostak said. While upcoming telescopes like NASA's James Webb Space Telescope and the European Extremely Large Telescope could tell us about the atmospheres of the Trappist-1 planets and perhaps a little about what's happening on their surfaces, it may be a while before we can take a direct image to see what they might look like to human eyes. Gillon's team told reporters the planets are likely too close to their star to get such an image. But study co-author Amaury Triaud from the University of Cambridge said if you could stand on the surface of one of the planets you would receive far less light from the star in the sky, perhaps comparable to the amount of light we receive just after the sun has set in the evening. However, the sun would probably never set on the daytime side of the Trappist-1 planets as they are likely tidally-locked, meaning they don't rotate on an axis and always face the same side toward their star, much like the moon does toward Earth. "The spectacle (from the surface of one of the planets) would be beautiful because every now and then you would see another planet, maybe twice as big as the moon in our sky," Triaud explained, adding that Trappist-1 might appear ten times as large in the sky as the sun does to us and be salmon-colored. That vision of what these newly discovered cousins to our planet might be like is largely just an educated guess at this point. Expect many telescopes to swing in the direction of Aquarius and Trappist-1 in the years to come to unlock its secrets. "People will get more and more news about this system in the coming months, "Gillon said. "The story is really just beginning."